Will Ethiopia's Grand Renaissance Dam dry the Nile in Egypt? 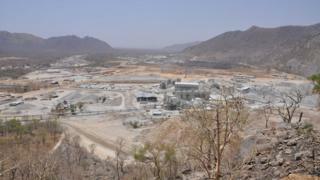 Ethiopia is pressing ahead with construction of a major new dam on the River Nile, despite stiff opposition from Egypt. BBC correspondents in both countries report from both sides of an increasingly bitter water dispute. A vast section of northern Ethiopia has been turned into a giant building site. Construction of the Grand Ethiopian Renaissance Dam (known as Gerd) is now about 30% complete. The whole project spans an area of 1,800 sq km (695 sq miles). Once completed, in three years, it will be Africa's largest hydropower dam, standing some 170m (558ft) tall. At a cost of $4.7bn (£2.9bn) it will also be hugely expensive - mostly funded by Ethiopian bonds and taxpayers. Temperatures here can get as high as 48C (118F). Most of the vegetation that existed on the dam site has been cleared to make way for the construction, and the area is now extremely dusty. In May last year, the builders achieved their first milestone when they diverted the course of the Blue Nile. What used to be the river bed is now being lined with layers and layers of concrete that will form part of the main dam. Some 8,500 people working at the site, where construction carries on 24 hours a day. Part of the actual dam structure is already taking shape. The workers are busy at work on what looks like a huge floor of concrete. Downstream, Egypt - which relies almost totally on the waters of the Nile, says their supply will be under threat. Egypt and Sudan currently get the lion's share of the Nile's waters under colonial-era treaties. While Sudan backs Ethiopia's plans, Egypt has remained opposed. Talks to ease tensions between the two countries have collapsed. Despite this, Ethiopian foreign ministry spokesman Amb Dina Mufti describes the dam as a "win-win" project. "Sudan has already seen the benefits and has come on board, we hope Egypt will see that too," he says. The concern in Egypt is about the potential threat to its dominance over the Nile. Egypt fears Ethiopia's dam will restrict the flow of this strategic waterway - the main source of water in a country where rainfall is scarce. The row started in 2011, and Egypt has been worried ever since that its annual quota of the Nile water might be reduced. This conflict comes at a time when different parts of Egypt are already suffering from a shortage of water. In the northern Nile Delta, the agricultural heart of Egypt, a lot of farmers are waiting with a heavy heart to see if they will be able to cultivate their land next summer. "With even less water, we will die. We can't survive," says Hafiza, one of the farmers. Ethiopia says its hydro-electric dam will not harm either of its downstream countries, Egypt or Sudan. However, Egypt is highly sceptical. "It is a matter of life or death, a national security issue that can never be compromised on," says foreign ministry spokesman Badr Abdelatty. Egypt is aware that some 30% of the Ethiopian dam is completed. It is still unclear what Egypt's next step will be.